Grandma made two kinds of zong zi: savory (pork filling) and sweet (sweet red bean or azuki filling). I used to sit on the kitchen counter and help her keep track of the two types of string she used to tie the little bundles – white for savory and red for sweet. Of course, what I didn’t appreciate back then was how adept Grandma was at wrapping the zong zi in the bamboo leaves. Now, I do. 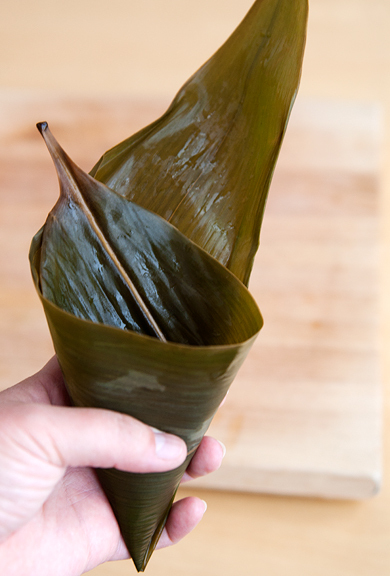 I wasn’t sure if I needed two bamboo leaves or just one to fold each zong zi, so I called Grandma to ask her. Her exact words (in Chinese) were, “You can use two leaves. If you’re good and know what you’re doing you can use one leaf… You should use two leaves.” Well, I did use two leaves at the start, but then I got nervous about running out of bamboo leaves so I switched to using one leaf. It’s because I get into this habit of hoarding. I hoard bamboo leaves, salsa, dried azuki beans, blanched almonds. You just never know when you will really need these items. After wrapping several dozens of zong zi I can offer a few pointers. The first being that you should make sure you don’t have a hole at the bottom of the cone when you start. Merely adjust the leaves until the end of the cone is sealed. Don’t overfill the cone with filling either or it will just spill out onto your work area while you wrangle the bamboo leaves around. Erring on the side of more string rather than less string is GOOD. 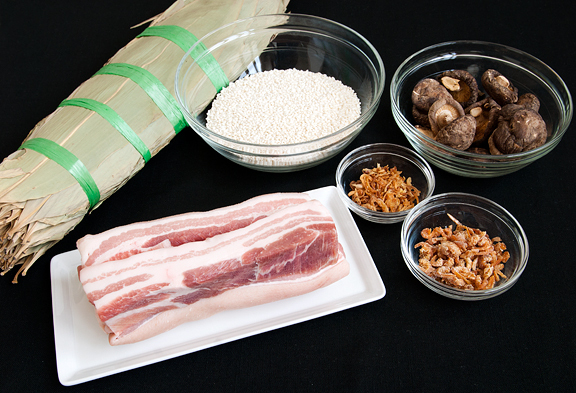 While I love pork belly, I think my next incarnation of zong zi will involve a less fatty cut of pork. And there will certainly be a next time since I scored more bamboo leaves on this trip (I never said my trips were not in some part motivated by food, right?). [Note: I discussed using a less fatty cut of pork with Grandma this morning and she said this rice doesn’t taste good unless you use something with a little fat – so there you have it from Grandma herself.] Rather than boil my zong zi, I used my beloved pressure cooker to steam them and it worked beautifully. Like tamales, you don’t just make two or three at a time – this is a production. Once the zong zi are cooked, let them cool. I toss mine into large ziploc bags and freeze them or keep them in the refrigerator. To reheat, I defrost them and then set them in a steamer basket for a few minutes until ready to serve. Take care when you unwrap them as they are usually quite hot and steamy. 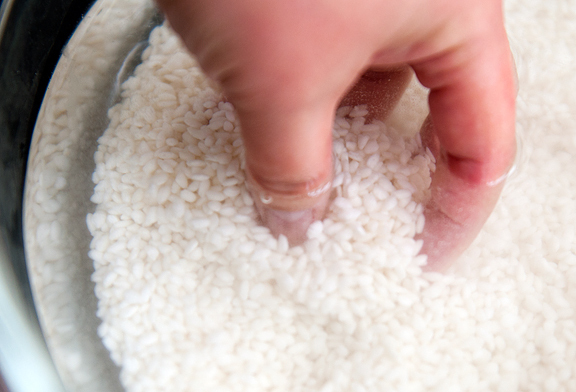 Rinse the rice until the water runs clear and soak it overnight. Drain the rice . 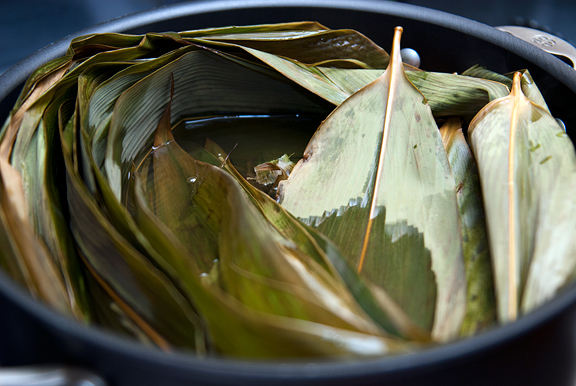 Rinse the bamboo leaves and string then boil them in a large pot for 5 minutes. Remove and drain. 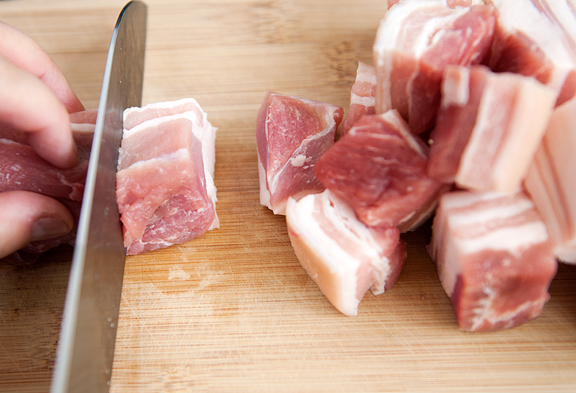 Slice the pork belly into 1-inch thick pieces. 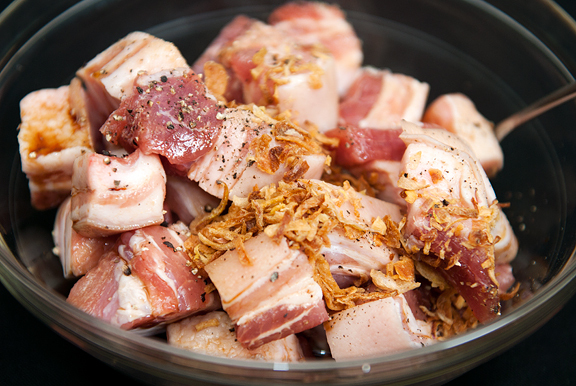 Marinate the pork for 30 minutes in 3 tablespoons of soy sauce, 2 tablespoons of fried shallots (you can get those in an Asian grocery store), 1/2 tablespoon cooking wine (I use Shoaxing cooking wine), 1 teaspoon of sugar, and 1/4 teaspoon ground black pepper. 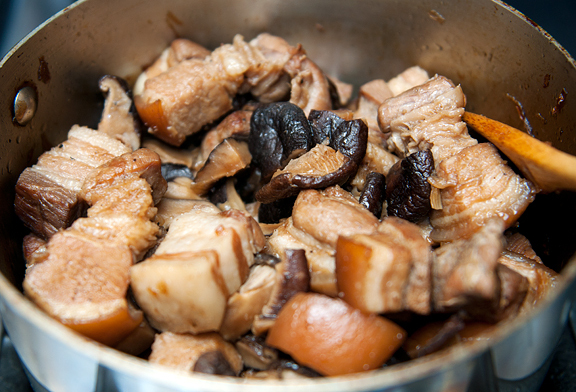 Place the pork, marinade, and the mushrooms in a medium saucepan and simmer covered for 30 minutes. Heat four tablespoons of vegetable oil in a large pan over high heat. Stir fry the dried shrimp until fragrant. Add the rice, 1 1/2 tablespoons soy sauce, 1/2 teaspoon salt, and 1/4 teaspoon pepper to the shrimp and stir until well-mixed (this step, I accidentally overlooked – but it still tasted great). Overlap two bamboo leaves lengthwise, head to tail (or just use one leaf). Curl the base in toward itself to create a cone at the bottom of the leaf (see photos if you don’t get what I’m talking about). Make sure the base of the cone is closed and won’t leak rice out. Put a few large spoonfuls of the rice mixture into the cone to fill halfway. Add a piece of pork and mushroom and (if using) egg yolk. Top with another spoonful or two of rice mixture until almost full. Gently pinch the sides of the cone rim in and fold the top of the bamboo leaf over and wrap around (how you do this is up to you, but I’m pretty sure I didn’t wrap mine properly). Tie the zong zi shut with the string. Place the zong zi in a large pot and cover with water. Bring water to a boil and the reduce to low and cook covered for an hour. I chose to steam mine in a pressure cooker with steam basket (30 minutes on high pressure, natural depressurization). Serve hot. Ha! My Nana was the same way with giving recipes – she’d always give me her version and an “easier” version for me to use. These look super delicious. Any idea what cut of pork you’d use next time? I’ve never thought of using a pressure cooker for this before! I’ll have to try that. Thanks! Cheers for the step-by-step wrapping guide! This is awesome. wow, those are my kind of bite-sized food ! I love chinese cooking… wish I had some kind of chinese connection to get all this delicious food regulary ! wow, what an ambitious project. impressive. Thank you for sharing this blog. I enjoy the time I spend cruising through your posts, old and new. I found you through food, and have stayed because of everything else. Thank you again, and I will bee keeping an eye out for bamboo leaves. Heh. 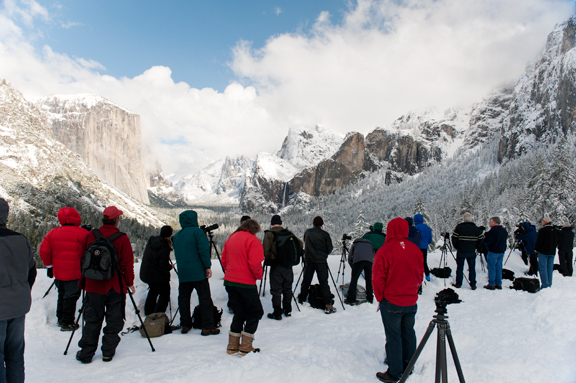 We found out about Badger Pass 2 years ago over spring break. They got several feet of snow the day before we got there which meant everything was closed. Not that we had any plans of skiing but it was an option that we thought we had. I *love* that you love your pressure cooker! If I had to pick one thing from my kitchen that I can’t do without, it’s my pressure cooker(s). Jen, you can use pork terderlion with its little fat in it. I prefer smaller cuts of the goodies. You can also add peanuts (Taiwaness adds peanuts in it) to it too. Y certainly did a good job of wrapping it. I have not made them in years. Lately, we eat this only when we go out for dim sum. yum yum yum. one of my all time favorite snacks! i also like it when they include an egg yolk (chicken or duck). i tend to like dipping mine in a sweet chili sauce, i cant remember what brand. but it adds a nice finishing touch. Amazing, the dish, and the step-by-step instructions. They look labor intensive, but I’m sure every bit of effort is well worth it. The end product looks absolutely, yummy! Along with all the photos, love your plum blossoms pix, as i find it’s symbolism inspiring- perserverance and resilience, courage and strength, “daring” to bloom in winter. 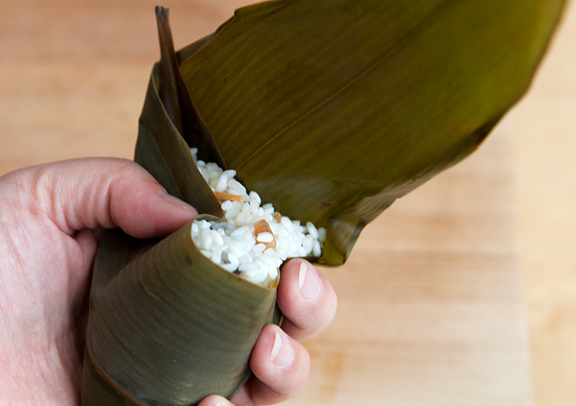 Your zong zi tutorial brings back warm memories of making them with my paw paw last year! Nicely done! I love Zong Zi and I make them at least once a year. I usually just marinade the pork and stuff the raw meat right in. I’ll try simmering it next time! Thanks. 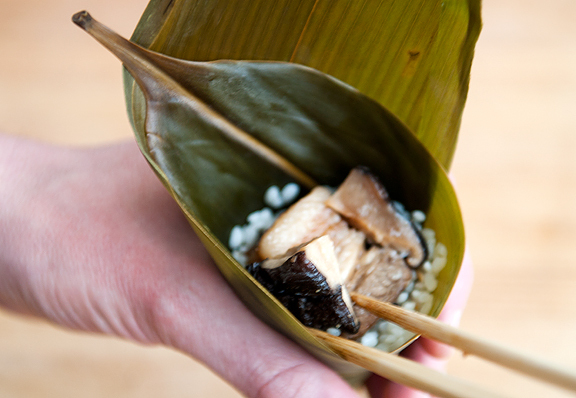 Jen, my favourite zongzi will include some chestnuts and salted egg yolk! That will be perfecto!! Good job for tackling an old traditional favourite!! And you are right! This is a big production. My grandmas will make hundreds each year for the occasion. Wow. These are absolutely wonderful! 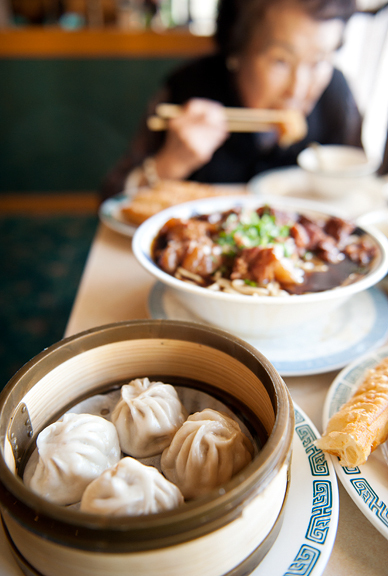 This brings back such memories of the all-time best food I had in China when I lived there. I was on a train with my high school friends (from the Shanghai Number 3 School for Girls). We had stopped at a station and someone was selling these from a basket on her hip. Everyone leaned out the window to buy some. 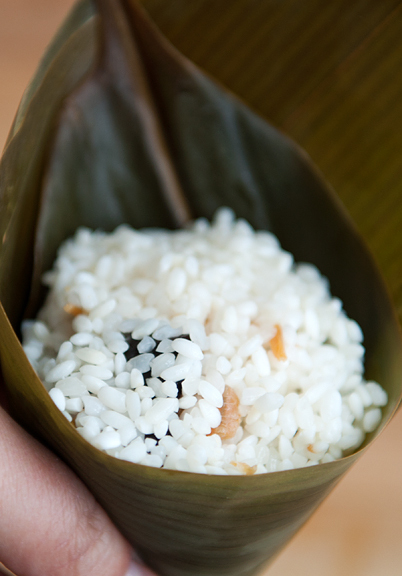 It was pure perfection – sweet rice with salty pork goodness, sticky and oh-so ooey gooey! Unforgettable! This post brings back memories. I thought mung beans is required though? No? I don’t remember having one without mung beans in them. Yay! I love you I love you I love you. Zong zi are one of my favorite snacks but my mom always bought them from the various old ladies from church so i never knew how to make them. And I find the ones you get from restaurants are really hit or miss, the homemade ones always seemed far superior. I can’t wait to try this recipe, thank you so much for another fantastic post. Hi! I loved this recipe, looks so yummy, I’m panamenian, tamales are really popular there…and this looks quite alike, aside from the rice, it’s fasinating how two complete diferent cultures have such a similar dish. And by the way, your photography its just breath-taking. Thank you for such a fantastic post. Great step-by-step pictures, as usual. Love the little bundles, they are so cute! So yummy… but where are the boiled peanuts? Or is this something only my family adds? 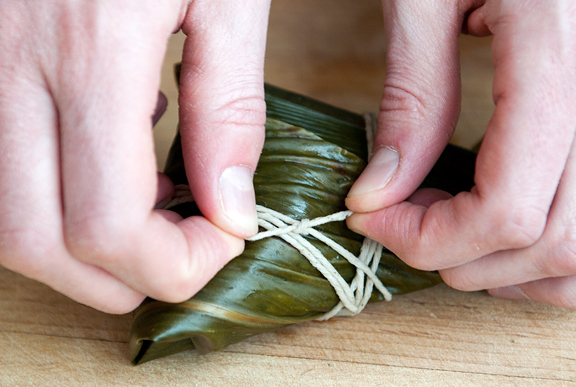 Your post brings back memories of wrapping zong zi with my grandma as a child. She’d make sweet (gan sui which I always thought as detergent water haha) and savory. The sweet ones were smaller and wrapped differently with a different twine pattern. Large ones included fillings similar to yours but grandma would add mung beans and boiled peanuts to her rice mixture, a small chunk of Chinese sausage, and occasionally a salted duck egg yolk. Needless to say, grandma made huge zong zi. I can clearly remember how she folded her zong zi as well…different technique but always two bamboo leaves for her ginormous zong zi. THANK you for the step by step process. 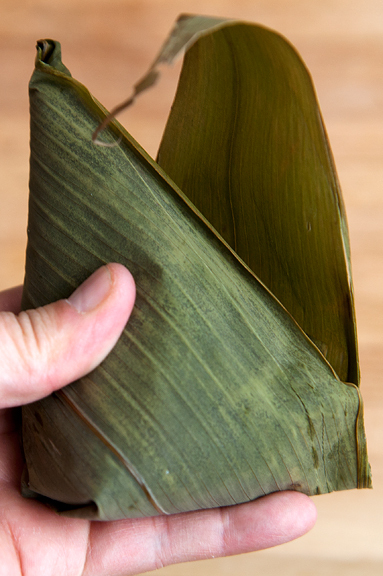 I would LOVE to make zong zi at home — this looks like a process worth taking on. I went to my maternal grandmother’s home in the countryside in Taiwan to “learn” how to do this! They made fun of me because I was overzealously stuffing too much….stuff inside. Typical of me. My aunt had made par-cooked nuo-mi-fan (with the sweet rice, cooked with a bit of minced pork, little shrimp, soy sauce) and we stuffed the leaves with that. Then we’d add the porky nugget-o-yummy in the middle and top off with more nuo-mi-fan. I think this way the rice gets more flavor throughout, and they steam faster. 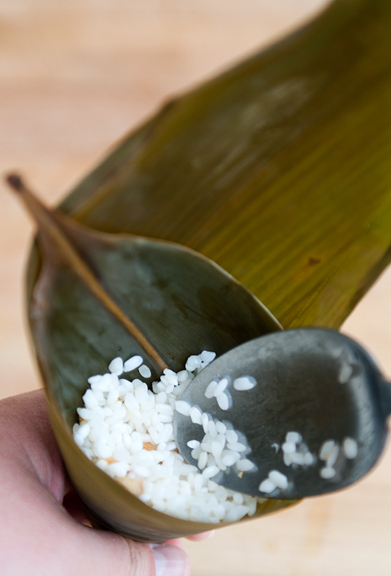 ok–this is a new food to me, and i have what may be a stupid question–do you eat the bamboo leaves, or are they just for wrapping and flavoring the rice? Yum, my husband would love that. I haven’t had that forever. Wow, looks delicious! I haven’t had pork belly in so long, this makes me crave it! Your recipe is very similar to mine! Joong are a lot of effort but worth it, as the ones from the asian stores where I live (in Australia) are decidedly inferior, lacking in taste and filling. I love my pork belly too, and I try to get the fattiest pieces. If not fatty enough, I look for pork backfat to supplement; your grannie is spot on, the fat pieces are my favourite part of the joong. I have boiled mine in the past but very curious about cooking them in the pressure cooker (love them). Can you please confirm that even if they are not submerged, the rice is still able to absorb enough water? Or do they have to be submerged? Alyson – seeing as Grandma told me that I would indeed need a fattier cut, perhaps pork shoulder? I’m sure there are options that aren’t as fatty as pork belly, but fattier than tenderloin. Steph F – mmm, Chinese sausage! I love that :) Thanks for the reminder. Yi – yes, I’ve seen recipes that call for putting the marinaded meat in raw. I decided to go safe, but I’m sure either way works! Mrs Ergul – wow!! Hundreds? That is so awesome. gg – I think you can put whatever you like in them. alice – you’re welcome! I feel the same way, so happy to finally know how to make them myself! Cheryl – I made a few sweet ones (just to see) and they’re quite simple. Plain rice instead of seasoned, and red bean paste (and red beans if you have them cooked and whole or mashed), then wrap and steam. 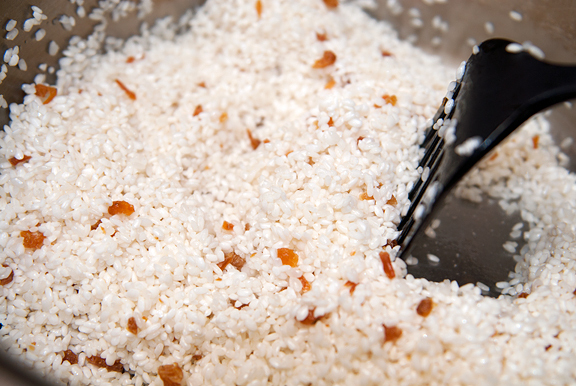 I think you can sprinkle sugar on the rice when you open them to eat too. Bettes – various folks add the peanuts. Our local Chinese restaurant (the only good one in Boulder) puts black-eyed peas in theirs. Pretty good! Anandi – ha ha ha. I’m pretty sure you can find bamboo leaves where you guys live! 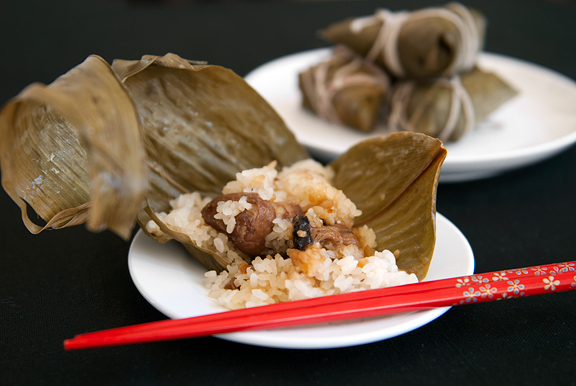 Lorinda – I placed my zong zi in a steamer basket in my pressure cooker. The water was high, but not touching the zong zi. They steamed up no problem! If you do submerge them though, I don’t think it’s going to hurt them. Some of the recipes I read said to place them in water and boil for an hour. These look SO incredibly good, what a process! 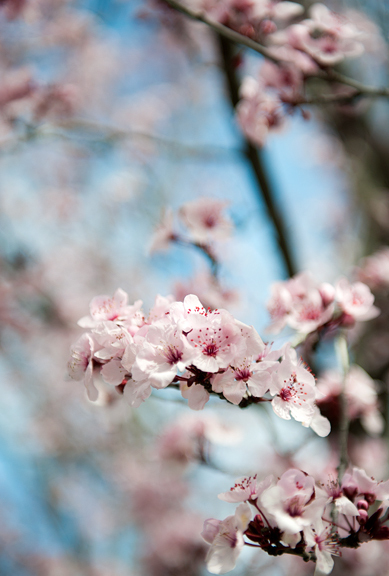 The picture of the flowering tree gives me something to look forward to because we’re moving across country to Alameda in a few months. I’m terrified and excited all at once because I’ve never been west before. Every little bit of information I can glean (even just a beautiful picture like yours) helps. my zhong zi are steaming away now. the wrapping process made me want to commit murder, i’m crossing my fingers and hoping they don’t all fall apart. I don’t have a pressure cooker, so how about how long would they need to be steamed? zong zi are one of my husband’s favorite food memories from his childhood in Taiwan. I made them once, years ago, but your way makes it seem like way less of a production. 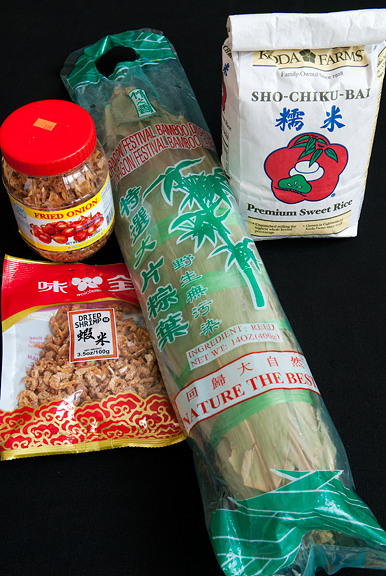 Living in Seattle, at least we have unlimited access to any asian ingredients we may need! they turned out really well! in the last three days i’ve eaten 7 of these, which seems kind of outrageous. i tried both the steaming method and the boiling and i actually found i liked the boiled ones better. thanks so much for posting your recipe! 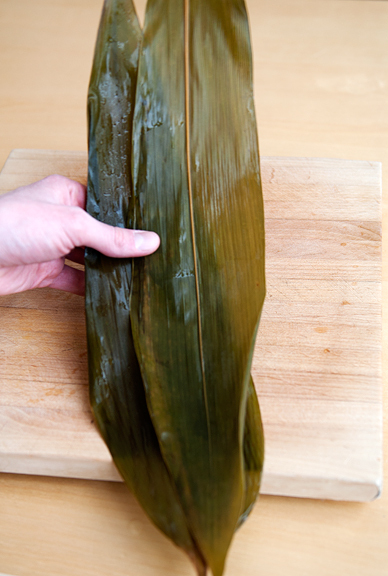 jena – in the recipe it says to boil the zong zi for an hour and i think the same applies to steaming. 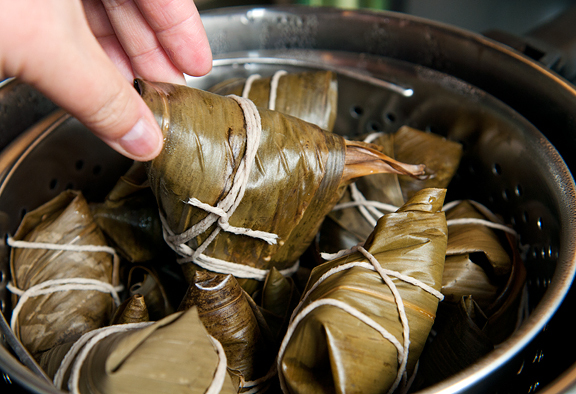 I really like the picture of the unwrapped Zongzi on your site, and I wonder if I could use it on a short article that i just wrote about Dragon Boat Festival?